If your food storage fare seems a little dull, add a delicious supply of Legacy’s freeze-dried chicken to your pantry and ensure your family will get well-rounded nutrition in a disaster. This tender 100% USDA Freeze Dried Chicken Dices is easy to prepare, tastes great in a variety of dishes, and has up to a 25-year shelf life. When you buy Legacy’s food storage chicken supply, you get a premium emergency food source. 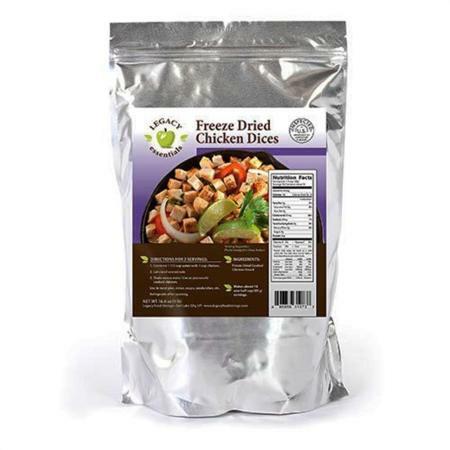 For the meat-lovers in your family, our tender freeze-dried chicken is an excellent addition to your food storage. 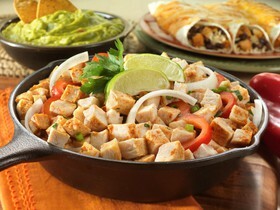 Try it by itself or mixed in with any of our other entrees for a protein-packed, deliciously balanced meal. 1. Combine 1 1/2 cups water with 1 cup chicken. 2. Let stand one minute. 4. Use as you would cooked chicken. Use in meat pies, stews, soups, sandwiches, etc.